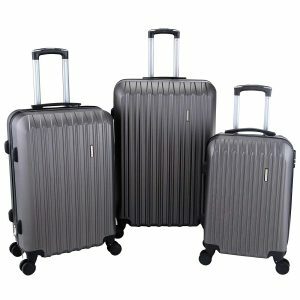 The brand new release sturdy, durable, lightweight, sleek and fashionable Murtisol ABS Hardshell Luggage Set comes with three pieces of luggage of 20” cabin and, 24” medium and 28” large suitcases. All three are made of solid ABS plastic which make them both lightweight and durable. This hardshell set is rated 4.7 out of 5 stars by 5 customers on the day of this review. You have two color options to choose from, black and grey. And although grey might be a bit better for locating it on the airport carousels, black color won’t be a problem thanks to the design of this luggage set. Even though the price is quite low for this product, it is made from premium, solid and durable ABS plastic material. The exterior is waterproof, and resistant to scratches, pressure, impact and heat. The suitcases in the set have the solid and quiet double spinner wheels that let you maneuver the bags easily as they rotate effortlessly in any direction- 360 degrees, smoothly and quietly. They are robust and sturdy enough to be able to carry large weights. The high quality alloy telescoping handles have an ergonomic design with push buttons in the middle and lock at three points easily. You can view the interior design clearly in the photo and appears to be rather practical with its stratified storage for keeping a variety of your items. With the decent partition configuration you can put your laptop, charger, clothes, books etc. separately. 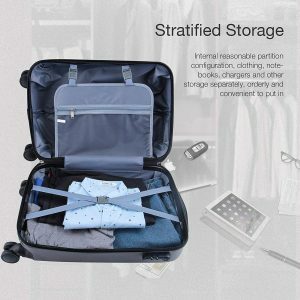 One half has the large zipped pocket for your private documents and the cross elastic straps on the other half will keep your clothes in place. Your items will be kept safe with its reinforced ABS solid plastic frame. The three-digit lock is not TSA- compatible but seems like a solid one with the explosion-proof zippers. The lock is preset to 0-0-0 and you can set it to a password you will remember easily. They all stack into each other, small into medium and the medium into large, which is good for shipping and storage purposes when not in use. Customers that purchased this set are generally very satisfied with its quality, lightweight, sizes, interior organization and design and modern appearance. It is offered with a generous quality guarantee and the customer support team will help you 24 hours 7 days a week in case you encounter any issues. This great quality guarantee naturally excludes the damage caused by you or the airport staff etc. You may use this set on your holidays for whatever occasion it may be or shorter and longer domestic or overseas business trips. And it is shipped swiftly via Amazon.com.